The marketing hype obviously works as the global market for weight loss is estimated to be worth US$586.3 billion in 2014. That is staggering considering obesity rates are the highest they have ever been per capita and still rising fast. Most people think that dieting and following fad diets has only been around for 40 - 50 years or so. Well you may be surprised that dieting has been around for thousands of years. The word diet comes of the Latin “deit" meaning god (good). It was about knowing the dietary path to deity or enlightenment. It meant that the body is literally your living temple. Inside your body we have the organs, they are the organisation of the kingdom’s workings within your temple. Right back to the ancient Greek and Roman times, people have been dieting. However the ancients had a very different view about diet. They believed it was about a way of life. They focused on a diet to improve their mental and physical health, so they were fit, healthy and strong - mentally, emotionally and physically. It wasn’t about shedding weight to fit into a dress for a party, then going back to your old bad habits. It was a lifestyle, a healthy lifestyle so they could keep diseases away. This lifestyle of healthy eating produced purity within. This freed their bodies of burden, allowing them to raise their mental, emotional and physical strengths to new heights - toward enlightenment. Things drastically changed over time and it was during the Victorian era where the whole fad-dieting craze really kicked off, and it’s sky rocketed over nearly 200 years. Most people have heard of the Atkins diet which is a high protein - low carb diet, but most will not realise that this dieting system was first popularised by a mid 19th century Victorian man named William Banting. William Banting published his dietary regime in 1863, titled “A Letter On Corpulence”. Like many fad diets today it became very popular going through six editions in two years, and selling around 50,000 copies. I have a copy of “A Letter On Corpulence” and the similarities between this and the original Atkins diet is uncanny. Following is a little history that may shock some of you, due to dieting crazes that were pushed onto the public for weight loss. 1820, The Vinegar and Water Diet: Lord Byron popularises the Vinegar and Water Diet, which entails drinking water mixed with apple cider vinegar. 1863, The Banting Diet: As mentioned above was a high protein - low carb diet which has many similarities to the Atkins diet, that was later published in the 1970s. 1901, The Tapeworm Diet: This came about at the turn of the century where Victorian women would swallow tapeworm eggs usually in the hope of losing weight. Sounds appetising - NOT! 1903, The Chew and Spit diet also known as Fletcherism: Horace Fletcher, stated that a lot of chewing and spitting was the ideal way to lose weight. Fletcher promoted chewing a mouthful of food until all the goodness was extracted and then spitting out the fibrous material that remained. He advised chewing some things up to 700 times. He was also known as “The Great Masticator”. 1919, Scales to measure body weight: The Continental Scale Company saw a market being created and introduced the first bathroom scale, which they called the “Health-O-Meter”. It’s still driving women wild right around the world to this day. Bin the scales I say! 1925, The Lucky Strike Diet: The Lucky Strike cigarette brand launches the "Reach for a Lucky instead of a sweet" campaign. They were trying to capitalaise on nicotine's appetite suppressing effects. Hmmm great job… lose weight and get cancer – where’s the corporate responsibility? Ha… yeah right! 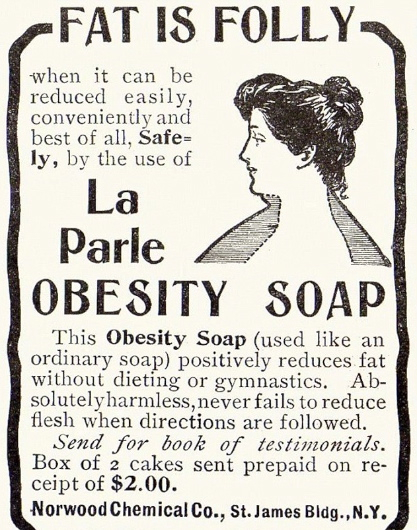 1930s, Slimming Soap: Wash away that fat. These slimming soaps had women rushing for the bathtub with products like Fatoff, Fat-O-NO, and La-Parle Obesity Soap, in the hope of slimming down. Imagine the water bills with people having 3-6 baths a day! 1937, Amphetamines for Weight Loss - Benzedrine: Was marketed for weight loss as Dexedrine in 1937. It was a highly addictive drug that was popular due to it being an appetite suppressant. Some side effects of Benzedrine were: rapid heart rate, elevated blood pressure, restlessness, insomnia, depression, tremors, headaches, vomiting, constipation, diarrhoea, loss of appetite and stomach pain. Sound like fun? Wasn’t long before the drug producers got on the weight loss bandwagon. 1951, The Cabbage Soup Diet: Stated that you can lose 10 to 15 lb (4.5 - 6.8 kg) of weight in a week by eating a limited diet of cabbage soup every day. 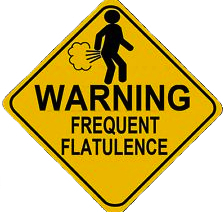 Imagine the flatulence… No, I’d rather not! 1954, The Tapeworm Diet again: Now dieters were swallowing beef tapeworm cysts, usually in the form of a pill and this was said to help you lose weight. 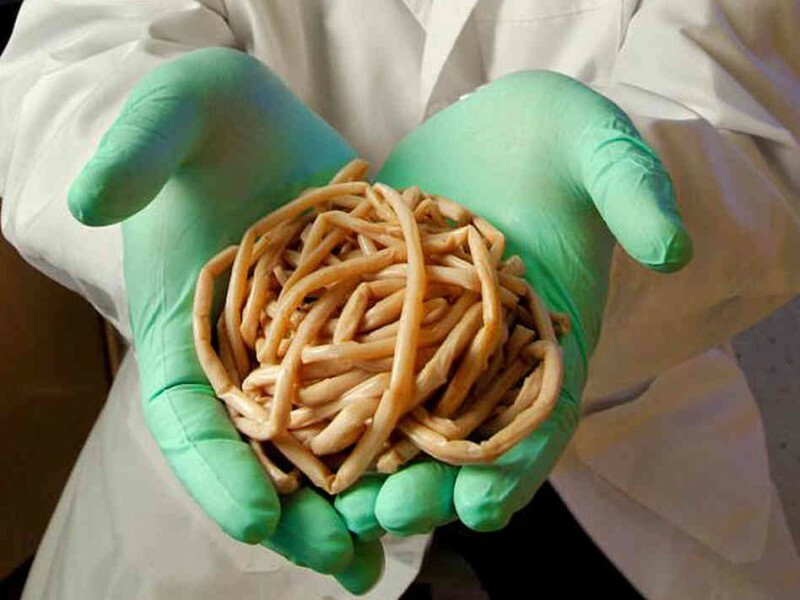 Little did they mention that a tapeworm can grow up to 9 meters (30 feet) in length and can cause many illnesses including headaches, eye problems, meningitis, diarrhoea, vomiting, epilepsy and dementia. Anyone for a spot of fishing? 1960s, The HCG (human chorionic gonadotropin) Diet: This is where dieters inject themselves with a hormone found in the urine of pregnant women and a 500 calorie diet per day. That sounds healthy… someone else’s urine in the morning – disgusting! 1972, Dr. Atkins' Diet Revolution: Is a high protein - low carbohydrate diet focusing on heavy meat consumption, next to no carbs and very few if any fruits or vegetables. It was frowned upon by many as being a quick fix which is unsustainable and unhealthy. 1975, The Cookie Diet: A Florida doctor, Sanford Siegal creates a plan where you eat cookies made with a blend of amino acids intended to control his patient’s hunger. It was an instant hit in Hollywood. Now there’s a surprise. The cookie diet was so popular that his practice grew to 24 clinics in a short period of time and he had more than 200 other physicians using the cookie diet approach and associated products in their own practices. 1977, Slim-Fast: A meal replacement diet. A shake for breakfast, a shake for lunch, and then supplemented with a sensible dinner. It becomes a diet staple for many. In it’s first year Slim-Fast was pulled from circulation along with all other fluid meal-replacement products after almost sixty dieters died while using 300-calorie-per-day liquid diet drinks. 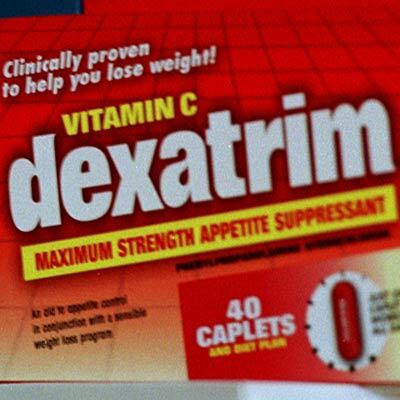 1979, Dexatrim: A diet drug containing phenylpropanolamine (PPA) appears on drugstore shelves. Its formula has to be changed after PPA is linked to an increased risk of stroke in 2000. Myocardial injury was also reported using Dexatrim (with PPA) at doses recommended for weight control. 1985, Fit for Life diet: Harvey and Marilyn Diamond publish "Fit for Life," which prohibits complex carbohydrates and protein from being eaten during the same meal. Sounds like a challenge. 1991, Low Fat Dieting erupts: Americans go low-fat, eating foods like McDonald's McLean Deluxe burger and any other low or no fat item they can get there hands on. Result… obesity rates continue to sore. 1992, Dr. Atkins' New Diet Revolution: Is his re-launched program. A high protein - low carbohydrate diet that now stated it induces a metabolic advantage because "burning fat takes more calories so you expend more calories". This theory was shot down when other studies concluded that there was no such metabolic advantage, and dieters were simply eating fewer calories due to boredom. Imagine how backed up these people would have been with all that meat and next to no fibre! 2000s, The Cotton-Ball Diet: This diet involves consuming cotton balls dipped in orange juice or lemonade. Experts have said that this is extremely dangerous. Unless you're dining on an expensive organic brand, most cotton balls aren't made of cotton. They're bleached, polyester fibres that contain a lot of chemicals. The cotton balls can become stuck in your digestive tract causing all sorts of problems. 2004, Diet Supplements: The FDA bans the sale of weight loss and diet drugs and supplements containing ephedra after it's linked to heart attacks. 2007, Alli hits the market: The non-prescription drug is taken with meals to keep your body from absorbing some of the food you eat. 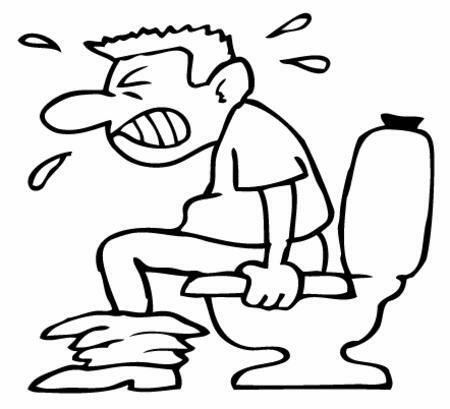 It’s notorious for its gastrointestinal side effects that are sometimes referred to as treatment effects, which can include steatorrhea (oily, loose stools). 2012, The New HCG Diet: This combines HGC injections with a strict 500 to 1500 calorie-a-day regimen. This is inviting interest and criticism. Review studies refuting the HCG diet have been published in the Journal of the American Medical Association and the American Journal of Clinical Nutrition. Both concluding that HCG is neither safe nor effective as a weight-loss aid. It’s being promoted on the Dr.Oz website… Now there’s a surprise. This is a brief history and I have left plenty out, as there are just so many fad diets, not to mention our modern day miracle pills, potions, sugar free soft drinks and low or no fat everything that is being sold to the public. When are people going to wake up? People shouldn’t be obsessed with weight loss. Instead, people should learn and implement a truly healthy way of living and as a by-product weight will fall off. If you think about it, the dieters are the ones who mostly lose out, as fad diets don’t work. However, the weight loss and dieting industry in general has made a fortune, as previously stated the current global estimates are US$586.3 billion in 2014. One of my favourite quotes is, “To me… Insanity is doing the same thing as everyone else, but expecting a different result”. Albert Einstein said that, and he was spot on. It’s so true. Obesity is at epidemic levels. However, with all this money spent, why aren’t people losing weight? Or if they have lost it, why aren’t they able to keep it off? Most people have tried many fad diets and if they haven’t worked for most of them, then what do you think the chances are of them working for you? Again… Insanity is doing the same thing as everyone else, but expecting a different result. It just doesn’t happen. If you want a different result then you have to do something different. To finish off, latest figures state that out of the top 10 causes of death, 8 are lifestyle related, meaning that they can be prevented. Health is everything, so decide today to not do another fad diet and choose to make the necessary lifestyle changes to improve your health for the long term. To great health - the Global Health Renegade.